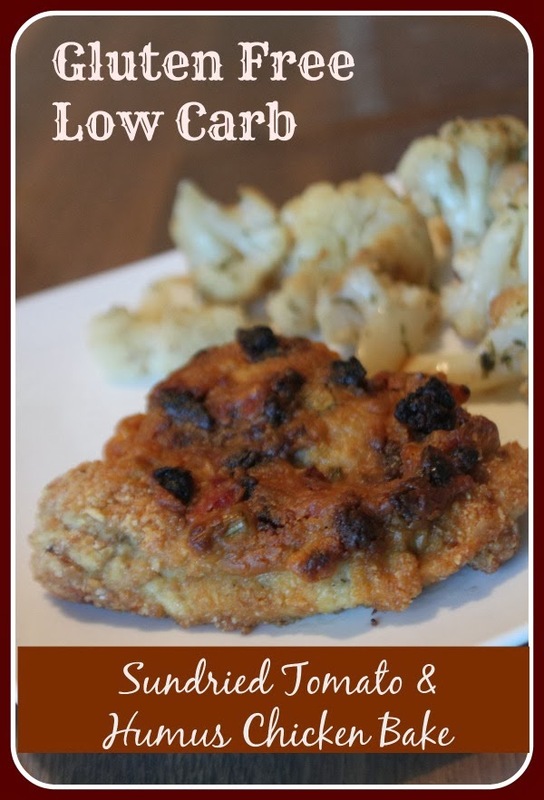 MamaEatsClean: Gluten Free Low Carb Sundried Tomato & Hummus Chicken Bake - SO EXCITED! Gluten Free Low Carb Sundried Tomato & Hummus Chicken Bake - SO EXCITED! Yep. I spelled Hummus wrong. Yep. I have no time to go back and fix it! OMG. I'm so excited to share this recipe at #mamaeatsclean. Ha, ha - I'm trying to figure out what a hash tag is used for so had to throw that in??? LOL. Anyway - back to business. I love making a baked chicken recipe. My old favorites used to be Baked Chicken Parmesan or my Lemon Garlic Parmesan Chicken. Both grain free and wicked good. But both wickedly full of dairy. And we don't eat dairy anymore. So I have been trying to figure out how to get that combination of savory breading with a creamy sauce. And I NAILED IT. So simple. Why didn't I think of it sooner. I always buy hummus and half the time we don't end up finishing it. Probably because I don't eat grains and hummus is best as a dip. But now I have an new use for it. As a topping for my breaded chicken. I used EVOO instead of egg, a grain free breading and no cheese. So safe for all kinds of diets. Grain, Egg and Dairy Free Sundried & Hummus Chicken Bake - SO GOOD! Preheat oven to 375 degrees. Grease a 9 x 13 glass baking dish. Cut chicken breasts in half to make 8 pieces. Pat chicken breasts dry and then cover with 1 Tbsp EVOO. Mix together breading ingredients. Dip each piece of chicken in breading mixture. Mix topping ingredients together. Cover each breaded chicken breast with topping mixture. Bake for 45 - 55 minutes. Less if your chicken breasts are smaller. Mine were thick so I let them cook longer (and I was busy doing something else) and they were perfectly moist but could have come out sooner. Enjoy.